​It’s been far too long since I’ve posted a field update – so this post will be a recap of the entire 2018 field season! 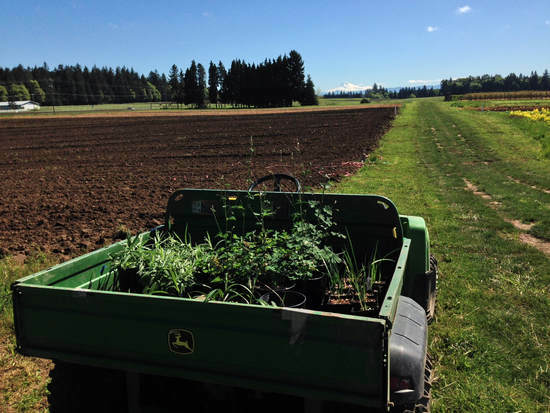 Sampling this year was successful, though it was a much shorter bloom season for almost all the flowers species, perhaps due to a combination of the heat, low rainfall, and lack of supplemental irrigation. I performed some summary statistics on the data, and there are some intriguing results from this year. 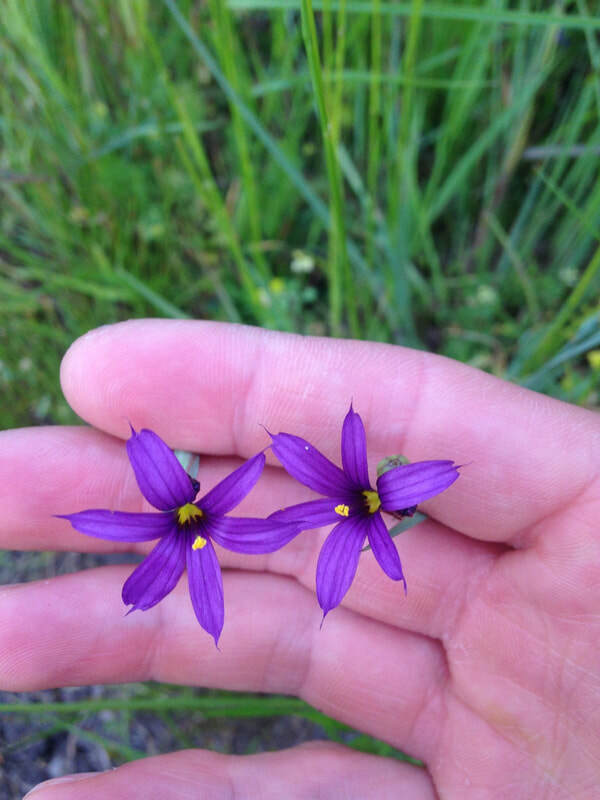 Only two (Gilia capitata and Nepeta cataria) flowers made it into the top-five most attractive in 2017 and 2018. The full results can be visualized in the two histograms below. 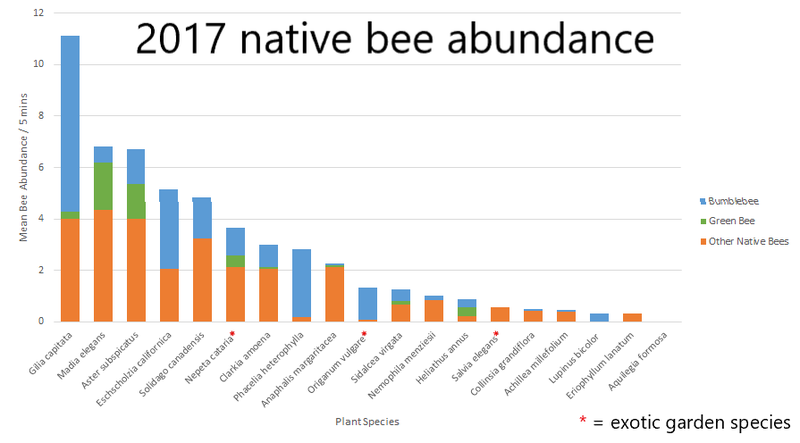 Three of the non-native garden species were found in the top five in 2018 (though I noted this visitation seemed strongly driven by honey bees). ​Because of this, I removed honey bees from the dataset and recreated the graphs. The 2017 visitation data is largely unchanged (though Nepeta cataria is less attractive, and Eschscholzia californica jumps into the top-five). 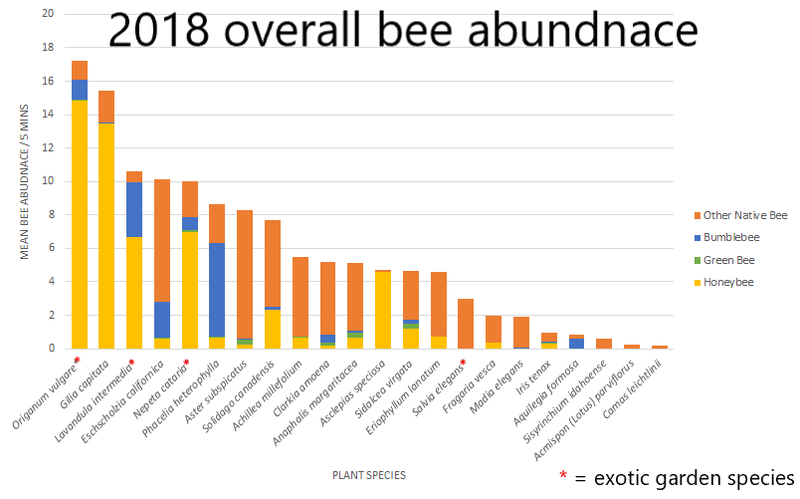 When only native bees are considered, the top-five most visited 2018 plants are almost completely different. Eschscholzia californica, Aster subspicatus, and Phacelia heterophylla are the three most attractive flowers. It seems like the native wildflowers are being visited more frequently by native bees. I also take vacuum samples from each plot so that we can identify pollinators (and other insects) to species. I’m excited that my 2017 and 2018 bees have been identified by taxonomist Lincoln Best! 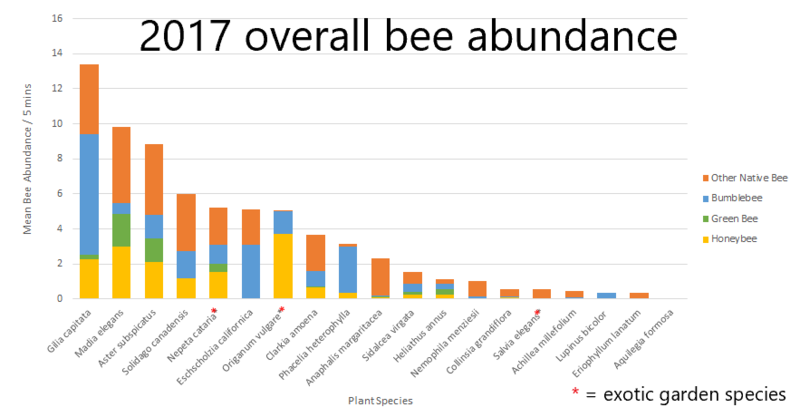 ​Across those two years, we collected 36 bee species (from 540 samples, which doesn’t include all the honey bee individuals). You might ask – is this many bees, or only a few? Simply put – we don’t know! Without knowing how many bee species are found at our site at NWREC, its hard to tell what this number means. However, I was excited to find that we collected two bumblebees that are on the IUCN Red List, Bombus fervidus and Bombus calignosus. 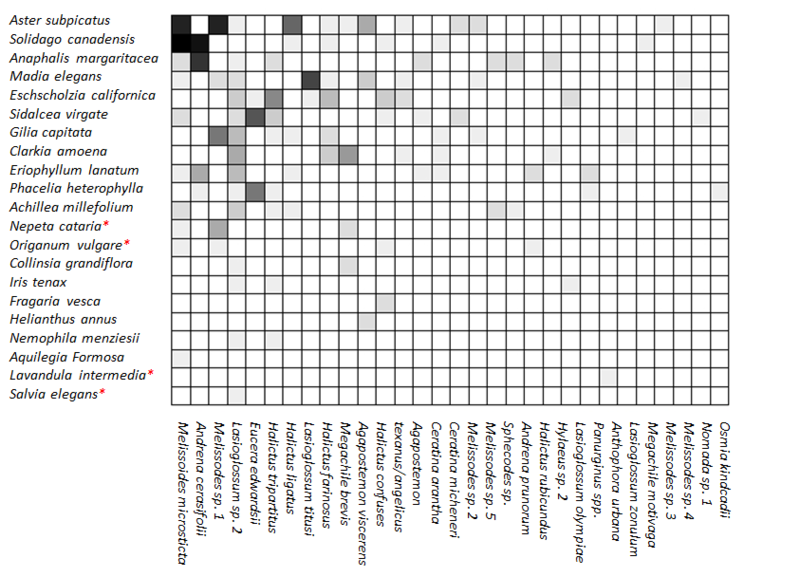 Below are a two pollinator interaction matrices to visualize these data, but I should note that these are very preliminary - they are not scaled by number of sampling events but are still a neat way to visualize interactions and richness data. 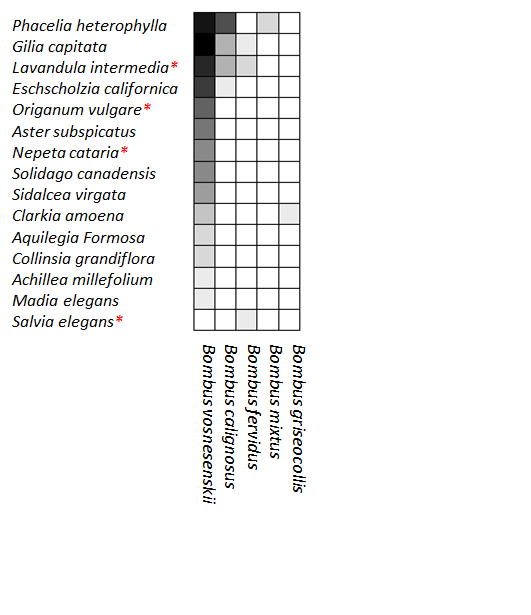 (Darker squares represent higher abundance; a white square means no bees were collected off that flower). 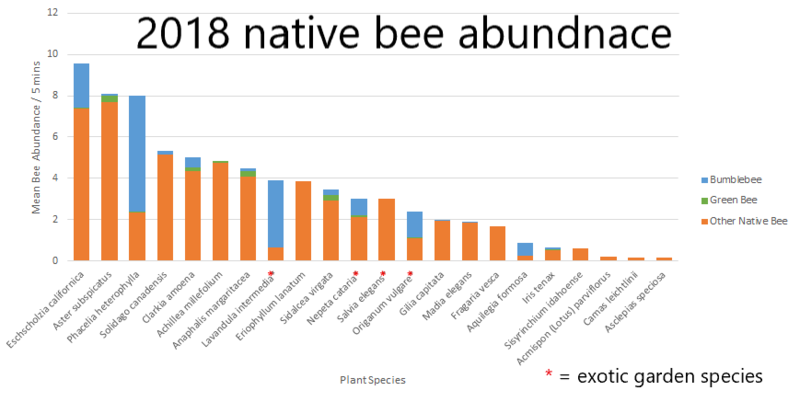 Its obvious from looking at these data that the answer to the question "which plants attract the most pollinators?" isn't simple! Are we interested in certain suites of bee species - honey bees, or bumblebees? Are we interested in high overall abundance, or high species richness? Some species attract many individuals but few species, while some plants attract a higher species richness but fewer overall individual bees. Additionally, there are also seasonal changes in bee populations to consider, as well as seasonal changes in flower phenology and floral display. 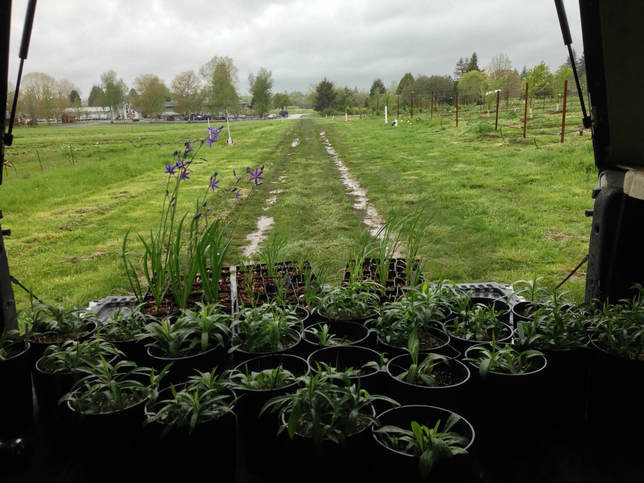 Luckily we're going to have a 2019 field season, which will help account for this temporal variation and allow us to acquire data for species that didn't flower in one or both seasons.